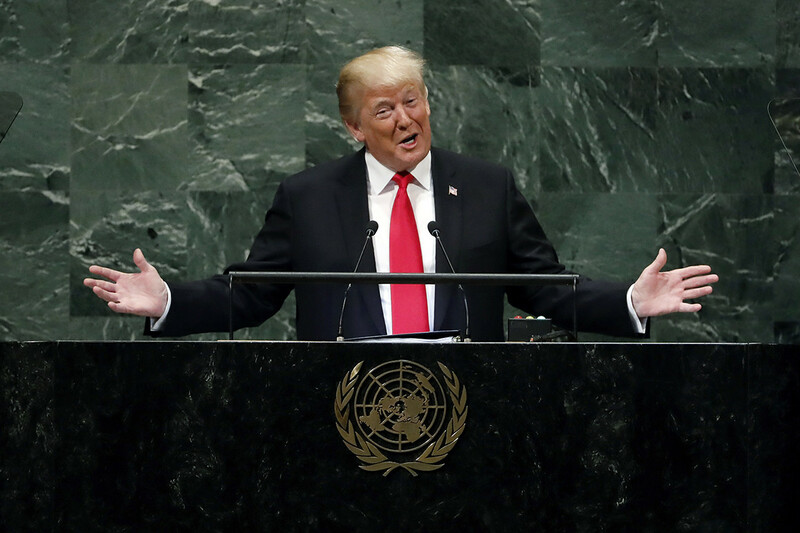 Home Politics Laughter, frowns and shrugs: Trump speaks to the U.N.
“Moving forward, we are only going to give foreign aid to those who respect us and, frankly, are our friends,” Trump said, implying that countries who pursued interests at odds with those of the U.S. could be cut off. He trumpeted his administration’s recent move to withdraw from the United Nations Human Rights Council, a global body that investigates and brings attention to human rights abuses. And Trump reiterated the White House’s stance that it will not engage with the International Criminal Court, an intergovernmental group with “no jurisdiction, no legitimacy and no authority” that he cast as a threat to U.S. sovereignty. The ICC began operations in 2002, set up with the intent of prosecuting international crimes such as genocide. But Trump on Tuesday blasted the institution for claiming “near-universal jurisdiction over the citizens of every country, violating all principles of justice, fairness and due process. Trump defended his ongoing use of tariffs against China — which has sparked a trade war between the world’s two largest economies — even as he said he had “great respect and affection” for Chinese leader Xi Jinping. On Russia, Trump said little except in the context of energy. He warned against pipeline projects in Europe that could benefit Moscow, including making a reference to the German pipeline that drew smiles from the country’s representatives.